A Chinese tourist destination decided to experiment with offering free toilet paper, the Wall Street Journal reports. Rather than the usual procedure in China, where people bring their own toilet paper, in Qingdao they now encounter a toilet paper dispenser when they enter the public restroom (and, naturally, pass it again on the way out). 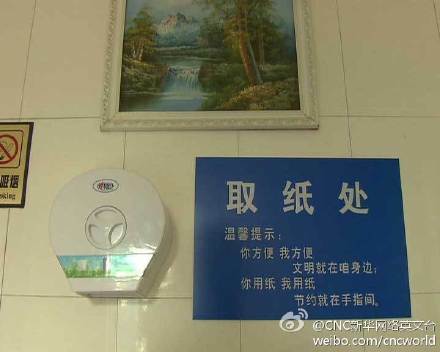 Now that the dispensers have been in the bathrooms for a month, it has become clear that visitors to Qingdao’s restrooms take an astonishing amount of care for their personal hygiene. Two kilometers (1.24 miles) of toilet paper disappear each day. In this case, the excess T.P. use seems to reflect our findings with other forms of cheating and stealing: most people are cheating a little, rather than a few people cheating a lot. Of course, there are exceptions. The toilet paper scenario meets the right conditions for people to cheat: they’ve got the opportunity and face no consequences for taking a bit extra, they can use the toilet paper later, and they can rationalize their behavior. They might tell themselves that the government is paying for their bathroom use in general, not only for that specific restroom; or that it’s expected that they’d take extra on the way out; or that they’ve already paid for it in the form of taxes; or that the government deserves what it gets. They’ve easily justified a way to walk out with wads of toilet paper and an untroubled conscience. But why steal something like toilet paper? One explanation probably has to do with the power of free. Maybe Qingdao’s bathroom users are so enchanted with the idea of FREE toilet paper that they would take it in any case, regardless of what they know about its value or usefulness. Another explanation that pops up a lot with government-provided goods is the tragedy of the commons. The theory goes that individuals will use a limited resource (like commons for grazing animals) in an unsustainable way, so long as they get the full benefit and the harm is spread across the group. In the case of the toilet paper, the theory suggests that people use no more than they need when they have to pay for it individually. But when the cost is spread out across Qingdao, they are happy to overuse the resource. The usual prescription is to make individuals pay for the resource on their own—in other words, to go back to the days without free toilet paper. But there might be a better solution. We can take research from behavioral economics to think of ideas that may be less strict than taking away the free toilet paper and, instead, simply push people toward lighter use of the product. How about replacing the landscape paintings above some dispensers with a picture of watching eyes—a tactic that has effectively encouraged people to clean up after themselves and pay on the honor system. civility is there for all to see. conservation is up to us. The sign hasn’t had a noticable effect yet, but it may be on the right track. Reminders like the poem sometimes work (p.41, The (Honest) Truth About Dishonesty) to keep people from stealing toilet paper. The Qingdao bathroom poets appeal to bathroom users’ social norms (“civility is there for all to see”) and allude to future benefits (convenience and conservation)—tactics that have been shown to work in getting people to wash their hands. But getting some sort of assent—like a signature—may be even more effective. Of course, if the bathroom management is going to ask people to sign anywhere, they might also want to keep watch over the “free” pens.